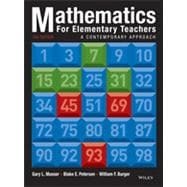 Mathematics for Elementary Teachers: A Contemporary Approach, 10th Edition makes readers motivated to learn mathematics. With new-found confidence, they are better able to appreciate the beauty and excitement of the mathematical world. The new edition of Musser, Burger, and Peterson's best-selling textbook focuses on one primary goal: helping students develop a true understanding of central concepts using solid mathematical content in an accessible and appealing format. The components in this complete learning program work in harmony to help achieve this goal. The Tenth Edition features the Common Core Standards to accompany the NCTM standards that are integrated throughout the text.